Buy your SolarEdge inverter and SolarEdge optimizers directly on our webshop at the best price. This SolarEgde inverter offer higher efficiency when they are connected to their optimizers. Through SolarEdge technology, you can install your solar panels with shadow. It give you a flexible install on different roof also becuase the solar panels are independant of each other due to the SolarEgde technology. 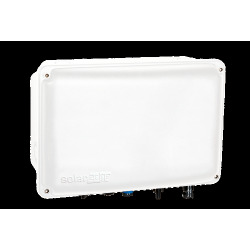 You connect the solar panel junction box to your SolarEdge optimizer. You realize the connexion between each solar panel. You have to connect in serie. You connect your cable to the SolarEdge inverter. It will communicate with its optimizer to look for the best production of your solar panels. You can win more than 3% without shadow and more than 35% with installation with shadow (to compare with standard inverter). You can send all datas to internet because all SolarEdge are equipped of Datalogger. The internet connexion is free. You can connect to SolarEgde portal for free. Order right now your SolarEdge inverter. You benefit a very price and quick shipment / Delivery time with Alma Solar.